Sickness and a lack of strength at Milan-San Remo (where he still managed fourth) and some other races during the classics season sees some pundits writing off the defending champion. Perhaps even the man himself. "I'm not 100 per cent like before, like three years ago, but every year is different and I have to just take it," Sagan told Cyclingnews after last weekend's Tour of Flanders where he finished 11th - with the main bunch of favourites. Some suggest he's holding back form for Liège-Bastogne-Liège at the end of the month, which Bora-hansgrohe directeur sportif Patxi Vila dismissed. "I just want relax after (Flanders) and then we're going to think about Roubaix in two or three days." Besides, the glue is literally only just drying on his 2018 Paris-Roubaix shower plaque. So. Never. Write. Off. Sagan. The bookies haven't - he remains the favourite. Bora-hansgrohe for 2019 Paris-Roubaix: Maciej Bodnar, Marcus Burghardt, Daniel Oss, Juraj Sagan, Peter Sagan, Andreas Schillinger, Rudiger Selig. 2017's victor wants a second cobble. The Belgian's best performance at Flanders came in 2014 and 2017 where he finished second, so a 10th there with the other favourites last weekend is no indicator of the strong form he utilised for podium finishes at this year's Omloop Het Nieuwsblad (2nd) and the E3 BinckBank Classic (3rd). He sees Paris-Roubaix going a little differently to its Belgian Monumental cousin. "I don’t think we will see such a big group in the final so, I hope to race aggressively and be fighting for the win. "My form is something I can control and I’m really happy with how I have raced so far this season and my sensations, so I’m looking forward to Sunday. "I love Paris-Roubaix. There is no race like (it). Obviously, I make no secret of my desire to win the Tour of Flanders but Paris-Roubaix is a really special race for me. It was even before I won in 2017 and of course, since then it holds a special place in my career as my first and, so far, only Monument win. I would love to win it again." CCC for 2019 Paris-Roubaix: Kamil Gradek, Michael Schär, Greg Van Avermaet, Gijs Van Hoecke, Nathan Van Hooydonck, Guillaume Van Keirsbulck, Łukasz Wiśniowski. Despite never finishing higher than a strong 12th at last year’s edition, Naesen gets a mention here purely because the 2019 Milan-San Remo runner-up finished seventh at Flanders last weekend while recovering from a bout of bronchitis. Hard to discount. The 2015 Tour of Flanders champion and its third finisher last week, plus his Gent-Wevelgem win pushes Kristoff into the thinking of those pondering a favourites list, despite his best Paris-Roubaix finish coming in 2013 with a ninth (and a string of DNFs). It is also why his UAE general manager Joxean Matxin is optimistic. "Our wish is to close the northern classics campaign with a significant result. Our goal is clear, a victory in the Hell of the North and just the desire to do well. "Kristoff will captain our team. He has been very effective so far and wants to set the record straight in Paris-Roubaix after a fall last year prevented him from being a sure protagonist. "We will have riders at his side to offer a great contribution and a Fernando Gaviria who, despite debuting in the race, has the necessary talent for to go strongly." The born-and-bred in Belgian team - even those on the team not from Belgium - lost Flanders last weekend. That's enough for some (mostly Belgians) to brand the Wolfpack's classics season a failure. But not only did gallant Gallic Julian Alaphilippe win a Monument for Deceuninck-Quick Step (and Strade Bianche) at Milan-San Remo and Kasper Asgreen finish second at Flanders but Štybar took to the top step at the E3 BinckBank Classic and Omloop Het Nieuwsblad this season. The 33-year-old is strong at the Hell of the North, finishing second in 2017 and 2015 and in the top 10, five times. “We did a good race in Flanders and at the end of the day taking second with Kasper was a nice result," Stybar said. "Unfortunately, I couldn’t feature in the final due to my illness, which began troubling me since Thursday, but I hope things will be completely different on Sunday. "It’s a pity I had this setback, because I worked hard to be in shape for these races and I was confident I could win De Ronde. It wasn’t the case, but maybe, and hopefully, things will be different in Paris-Roubaix, a race that suits our team and where we have an impressive record." His team will also field 2017 Tour of Flanders winner Philippe Gilbert and last weekend's runner-up Asgreen. The 2015 Paris-Roubaix champion has the form as runner-up at Gent-Wevelgem, and Trek-Segafredo has the team but they're just lacking a certain something at the moment, according to team general manager Luca Guercilena. “It is a big disappointment for us because, obviously, this is not the level we want to be. Now, we need to turn the page and look at next week for Paris-Roubaix...we have to," he told Cyclingnews. 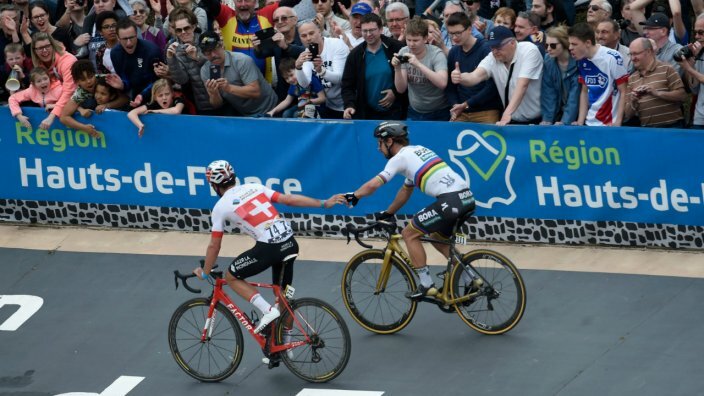 After the German's resurrection style win on last year's Paris-Roubaix Tour de France stage, victory on Sunday would equally be the stuff of legend. It was fitting John Degenkolb won over the cobbles in Stage 9 of the Tour de France, as no one in the peloton has endured a rockier road over the last few years. Last weekend's Tour of Flanders surprise winner Alberto Bettiol said to expect more pink at the front of races. So don't be surprised if you see Taylor Phinney and Sep Vanmarcke feature at the Paris-Roubaix pointy end. Classics specialist Vanmarcke has finished seven times at Paris-Roubaix, four of those times in the top 10 including finishing second in 2013 to Fabian Cancellara. The veteran performed strongly for Bettiol last weekend. Taylor Phinney has only managed an eighth in 2018 as his Paris-Roubaix best, but he's got the engine and as Bettiol's win demonstrated, the team has the tactical nous and now, most of all, the belief. EF Education-First for 2019 Paris-Roubaix roster TBC. Mathieu van der Poel's team didn't nab a Paris-Roubaix wildcard so Wout van Aert flies the starry cyclo-cross, crossover flag alone on Sunday. The world champion on the grass and mud finished fourth last weekend, fantastically coming back from a crash while Van Aert finished 14th. “It was a really tough race," the 24-year-old said after Flanders. "This was the best we could do. I didn’t have much left in the end." Jumbo-Visma director is remaining upbeat as he looks forward to Paris-Roubaix, which van Aert finished 13th on debut last year. "We have a young team and we cannot expect miracles," he said. "As a team, we were not as strong today as in recent weeks. That is a pity, but next week we will try again on the way to Roubaix." Matteo Trentin certainly has some form this season but without Luke Durbridge and Alex Edmondson (plus Mathew Hayman now in different Mitchelton-Scott kit) and with a young, valiant squad perhaps he will lack some support. But the Italian wants to finish his respectable classics season on a larger high. "At Flanders I didn’t have a good day," he said. "I hope it was only that day and let’s see if this Sunday will be a little bit better for me. Director Laurenzo Lapage says the terrain of Paris-Roubaix will better suit Sunday's squad. He's finished sixth, twice (2016, 2009). If Mathew Hayman's career-twilight victory copped us in the feels in 2016, what would a HH win do to us? Watch Paris-Roubaix on Sunday 14 April 2019, LIVE, FREE and in HD streaming online via the SBS On Demand app from 6.15pm AEST and on SBS VICELAND from 9.30pm.